Convertible Photochromic: Our Photochromic Lenses are made from optical grade polycarbonate and are both impact and scratch resistant. They block 100% of harmful UV rays and are horizontally decentered to eliminate distortion caused by the frame wrap. Photochromic lenses darken when exposed to UV light. 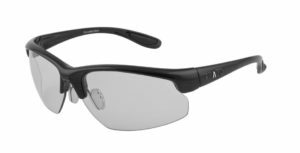 Competition shooters, golfers and other sports enthusiasts love the fact the lenses automatically adjust to changing light conditions. We offer Yellow to Gray/Green, Tan to Brown, Vermillion to Purple and Clear to Gray transition colors. The Clear to Gray lenses feature a new photochromic technology that cause the lenses to transition more rapidly than anything on the market.